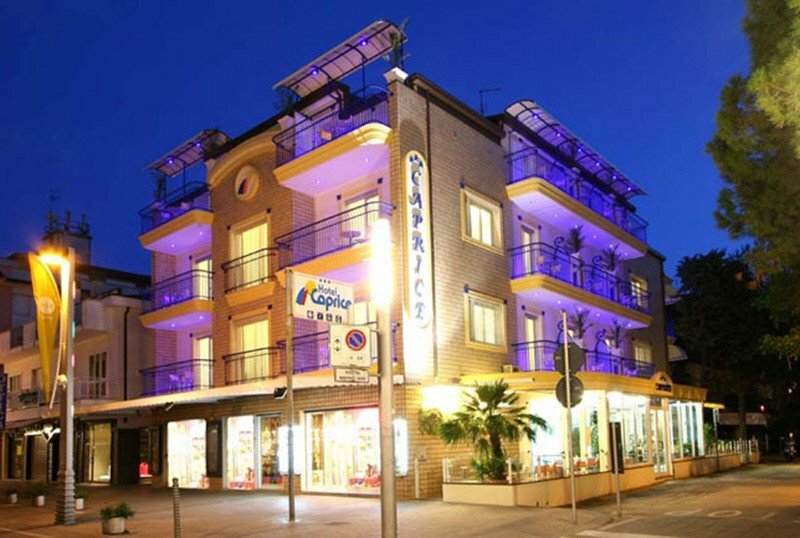 Hotel Caprice is a 3 - star hotel in the center of Riccione, managed for over 60 years by the Bazzotti family. Completely renovated, it is located near the sea and has parking, elevator, WI-FI, services for children. Small pets are allowed on request. The hotel is located in the center of Riccione, near the beach. The garden overlooks Viale Dante, an evening pedestrian area full of shops that leads to Viale Ceccarini. All rooms have been completely renovated and have a large balcony or balcony, free WI-FI, mini fridge, air conditioning, private bathroom with shower, hairdryer, LCD TV 22 "with digital terrestrial, electric shutters, telephone, safe, orthopedic nets and mattresses, bathrobe. FAMILIES: large family solutions with 4 beds are available (no bunk bed). Garden, open-air porch with outdoor tables, free use of bicycles, elevator. PARKING: on request secure and covered parking, accessible 24 hours a day, 400 meters from the hotel. CONVENTIONS: beach, amusement parks on request subject to availability. BREAKFAST: buffet with a wide choice of homemade desserts, croissants, yogurt and other sweet and savory dishes. LUNCH AND DINNER: menu with 3 or more choices with fish and meat dishes, salad buffet, appetizers and hot and cold side dishes, different types of desserts and fruit. Pasta and desserts are homemade. In hotel: pediatric consultation on request. In the room: on request cradle-cot, side rails. At meals: high chairs, baby food. On the beach: children's playground area, entertainment. The hotel has an agreement with the "Lido delle Sirene" Bagni n. 101-102. Here guests of the hotel can use the large fenced game area for children, beach-volley / mini-soccer sports fields, bocce court, canoes, "spiaggine", hot showers, shaded fitness area, relax area with magazines. , ping-pong table, afternoon entertainment for children from Monday to Saturday, WI-FI connection. For paid guests: heated pool and two heated hydromassages. Check in: the rooms will be delivered before 13.00 we generally can deliver them even before, in any case if the room is not available at the arrival of the guest we will give our guests the opportunity to change and go to the beach so as not to create any inconvenience, we will keep we will carry the luggage that the guest will find directly in the room on his return from the beach. | Check out: During the summer season the room must be vacated by 10 am; possibility to leave the luggage at the hotel for those who want to leave in the afternoon.During the spring bridges and Easter we usually give the possibility to postpone the check out in the early afternoon.In the Easter and Spring Bridges the room will be available until the early afternoon . Prices are per day per person for a min. 3 days and 5 days with All Inclusive service for stays of less than 3 nights or 5 in all inclusive the price will be subject to a small supplement. TOURIST TAX: excluded from the price list. € 1.80 per day for each person from 14 years up to a maximum of 7 days. ALL INCLUSIVE: Full board or half board + water, wine and drinks with meals + beach service (1 umbrella / tent + 2 sun loungers from the 4th row of tents towards the huts). - In the event of early departure, a cancellation fee is required for the cancellation of the booking and no-show. - The reservation is considered valid upon receipt of the deposit. - 02 June: for stays of less than 3 nights the price will be subject to a surcharge. Contact us without obligation to receive the best detailed offer. Limited offer and can not be combined with other promotions. Spend your 2019 summer holidays in Riccione! Minimum stay of 5 days in All Inclusive starting from € 56.00 per person per day. Our Hotel is in an excellent position very close to the sea, the cuisine is genuine and taken care of, excellent cleanliness. Contact us without obligation to receive all the details and a quote dedicated to you. The All Inclusive formula includes all the services to spend a fantastic holiday both at the hotel and at the beach: relaxation, good food and fun. Highly appreciated by our guests: the ideal location in the center and near the sea, the reception and availability, the genuine and well-kept cuisine and the excellent cleanliness. The modern beach has a swimming pool and many services to make your stay at the sea unique. Request the detailed proposal to find out the services included.